Don’t you just love September? 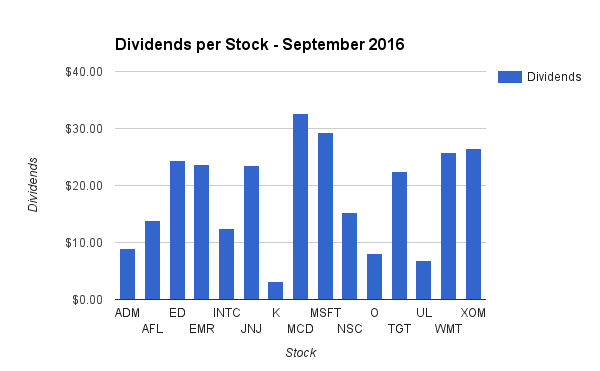 The hint of fall in the air, football season, and of course – dividend stocks! 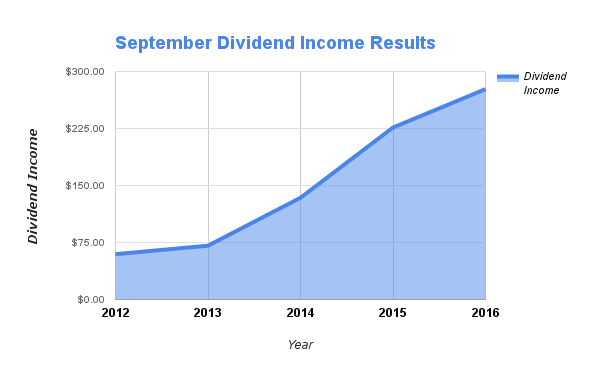 September is just one of those great months for dividend income. Some of our biggest dividend earning companies pay every September – as well as March, June, and December. This is just the way the quarterly dividend cycle works. Basically, for the past couple of years – we have been setting a new all time dividend income record every time March, June, September, and December rolls around. And this September did not disappoint! Our dividend income results for September 2016 set a new all time record high! We didn’t quite reach $300 in dividend income for the first time ever, but we will certainly blow past that by the time next September rolls around. As I mentioned earlier, we set a new all time record for dividend income in a month. I am very confident that we will set yet another record in 3 short months when we report December’s earnings. We saw an increase of over 22% last month compared to September 2015! Months and months of investing new money has helped to increase our dividend income. Over the past couple of months, we have been keeping more of our available cash on hand to help pay off some debt. For the first time that I can remember, we didn’t invest a single dollar of new money last month (August). In September we invested a little and we hope to pick back up where we left off in October for investing new money. 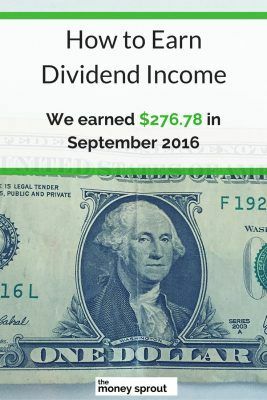 The dividend income earned in September ($276.78) was up over 22% from the same time last year. This is yet another all time record high for our dividend income earnings. I feel very confident that we will set another record in 3 more months when December rolls around. Our goal for 2016 is to earn $2,250 in dividend income. To date, we have earned $1,413.02 in dividends for the year. At this point, we are on pace to earn a little over $1,875 in dividends for the year. There is no chance of hitting our 2016 goal, so we are trying to reach a grand total of $2,000 for the year instead. We have a shot at that but it will be close. Full Disclosure – At the time of this writing, we owned shares in the following stocks noted in this post – ADM, AFL, ED, EMR, INTC, JNJ, K, MCD, MSFT, NSC, O, TGT, UL, WMT, and XOM. The material above is not a recommendation to buy. Please do your own research on a company before deciding to invest.